Apple's iPad shipments declined, but iPhone sales were strong as the company reported a hike in profit and revenue during the second quarter of 2014. Apple's net profit was US$10.2 billion for the second fiscal quarter of 2014, up from $9.5 billion in the same quarter one year ago, the company said on Wednesday. Revenue was $45.6 billion during the quarter ending on March 29, increasing from $43.6 billion in the same quarter last year. Analysts polled by Thomson Reuters had been expecting revenue of $43.5 billion. International sales totaled 66 percent of the revenue, Apple said. IPhone shipments totaled 43.7 million units, increasing from 37.4 million units in last year's second quarter. IPad shipments totaled 16.35 million, falling from 19.48 million units. Mac shipments increased to 4.13 million units during the quarter from 3.95 million units a year ago. "We're very proud of our quarterly results, especially our strong iPhone sales and record revenue from services," Apple CEO Tim Cook said in a statement. The company is looking forward to introducing "products and services that only Apple could bring to market," Cook said. Major product announcements are expected in early June at Apple's Worldwide Developer Conference in San Francisco. Apple had a relatively quiet fiscal second quarter, with the most important announcement being incremental updates to the 9.7-inch iPad with Retina display, and its price drop to $399. Apple had trouble keeping up with demand for the Mac Pro during the quarter, and the product page shows ship times with three- to five-week delays. 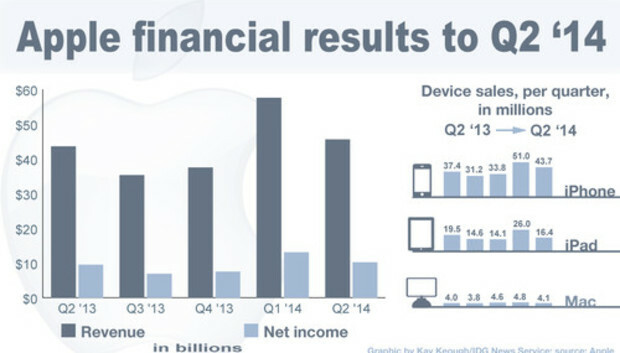 Apple is projecting revenue of between $36 billion and $38 billion for the third quarter.